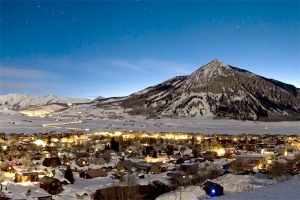 For 30 years, local environmentalists have been fighting with Crested Butte’s owners over a proposed controversial expansion of the ski resort. Can skiers and snowmobilers coexist? Unconfirmed wolf sightings in Oregon are on the rise, and wolf advocates are arguing with ranchers over how to handle the return of the predator packs. Federal biologists say the threatened Yellowstone grizzly population is healthy and increasing, but conservationists say the bears still face many long-term risks. Kniffy Hamilton, supervisor of Bridger-Teton National Forest, Wyo., has issued a draft environmental impact statement that would not allow oil and gas drilling on land near the Gros Ventre Wilderness. In Wyoming, backcountry skiers are upset to find that the Park Service's decision to ban snowmobiles from Yellowstone and Grand Teton may also ban skiing in some areas, to protect bighorn sheep. Environmentalists say the new Yellowstone bison management plan put together by Montana and the Park Service won't really help the bison much. Republicans are trying to undo the Clinton administration's planned phase-out of snowmobiles in Yellowstone and Grand Teton national parks. A final winter use plan for Yellowstone and Grand Teton national parks will ban snowmobiles altogether by the winter of 2003-2004. The Jackson Hole Airport near Grand Teton National Park has decided to allow some helicopter flights, despite fierce local objections. Following protests by downwinder Jackson, Wyo., residents, the Department of Energy agrees to scrap nuclear-waste incineration plans at the Idaho National Engineering and Environmental Laboratory. The Park Service says that snowmobiles will likely be banned from Yellowstone and Grand Teton national parks by 2002-2003. The 10th Circuit Court overturns a controversial ruling and decrees that the 300 transplanted wolves in Yellowstone National Park were not illegally reintroduced. Flamboyant Wyoming attorney Gerry Spence is at the head of a legal challenge to the Idaho National Engineering and Environmental Laboratory's plan to build a nuclear-waste incinerator, which Wyoming residents fear could send emissions into their state. Almost 50 years after biologists dumped DDT on Yellowstone Park to kill the spruce budworm moth, traces of the pesticide remain in the ecosystem. Despite word from the federal government that bison do not threaten cattle with brucellosis, Montana continues to crack down on stray animals and arrest protesters. Conservationists and boaters are battling over American Whitewater's attempt to open Yellowstone's rivers to kayaking. Even though the federal Animal and Plant Health Inspection Service admits there is little risk of cattle catching brucellosis from calves, yearlings and bulls, Montana's Dept. of Livestock is hazing all stray bison back into Yellowstone. In Wyoming, Grand Teton National Park officials and environmentalists are battling airline representatives who want to expand the runway at the Jackson Hole Airport, which is located inside the park. Environmentalists object to a Forest Service plan to build a new snowmobile bridge across Cougar Creek near the edge of Yellowstone National Park. Critics blast Yellowstone's draft management plan for bison, which would quarantine, vaccinate and reduce the size of the herd to deal with the threat of brucellosis.